Check out the simple video here or photo series below. Using cardboard cut 2 circles and then another smaller one in the middle. You will then cut a slit in each to easily wrap the tulle around. Using a roll of tulle wrap around till it's a good thickness. Cut in between the cardboard and use the open slit for this. Open the cardboard and tie ribbon or any string into a tight knot. Remove the cardboard and use again. Add a chain by knotting the string a few times through one of the links. 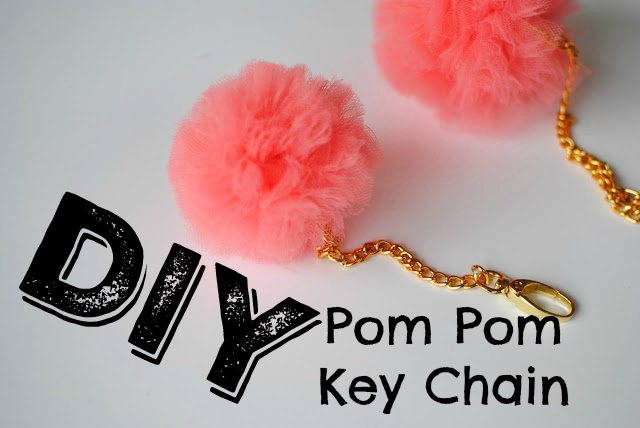 Then add a keychain loop through the top of the chain link using pliers. Make these for your friends, with your friends, or the kiddos love them too. Size, color, and chain is up to you. Thank you Laura for sharing this idea! so girly ! i love it !! I would better do it for my dog. She loves such things to play with. Thank you for inspiration, keep on posting! The designs were mind blowing no words to express. I am a professional writer of the essay writing service . If any tips for improving the writing skills along with the online writing service contact our site. Hey, Here I am in the quest fo best portal spider solitaire game free online. You can visit here and can play these free online card games without any registration or any downloading process. of the future as this is really what I was looking for; I am very comfortable and pleased to come here. Thank you very much.